Plane food was horrible as expected. I didn’t touch it one bit. Thank goodness dad has membership to lounges in the airport that provide decent bites before the plane ride or else I will be one starved traveller. 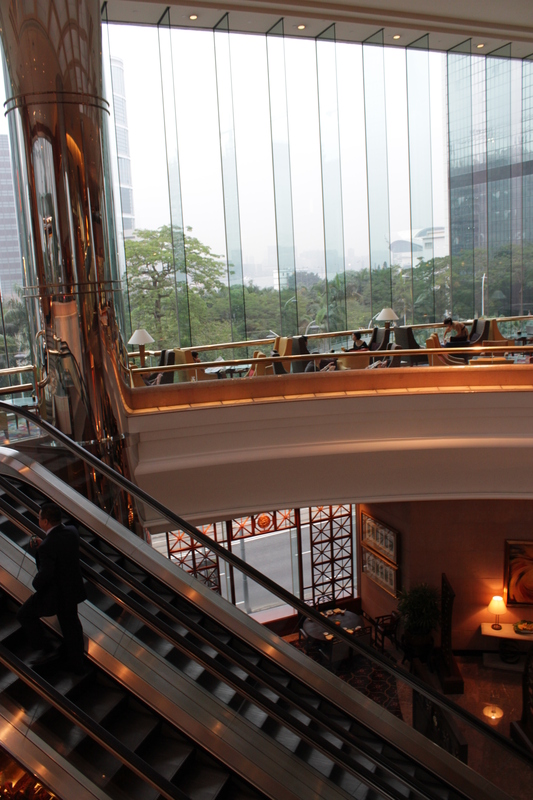 JW Marriot is a swanky hotel smacked right on top (literally) of the Admiralty mtr station. Hong Kong consists of Hong Kong Island, Kowloon and the new territories and JW Marriot is in Hong Kong Island. We were tired and hungry from the plane ride so after discussing with the concierge, we decided to dine in the restaurant just down the escalator, Man Ho. Our usual haunts like yun kee were fully booked and we really didn’t have the patience to wait. This is a fine dining restaurant so we felt a little out of place at first. Everyone was dressed in beautiful evening wear while we were in contrast clad in casual clothing like polo-T and jeans for me! 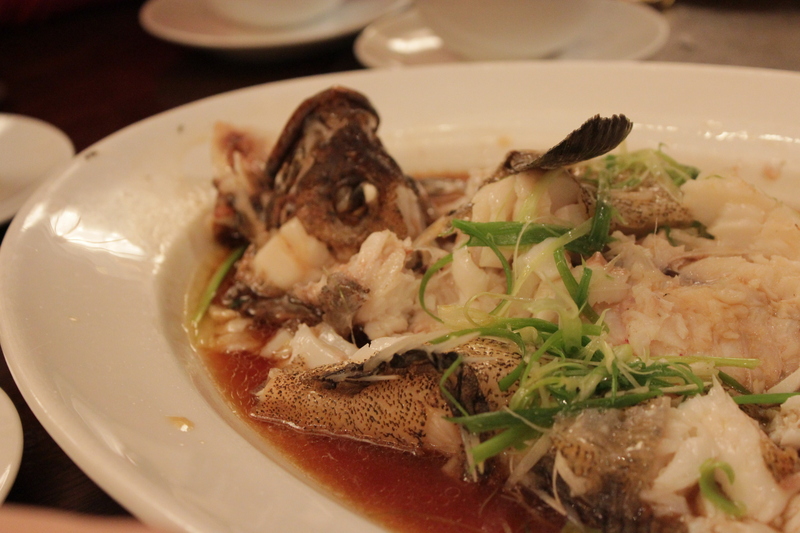 For starters, we had fish bone soup which to our surprise came with a milky base. We were a little apprehensive at first because our family dislikes anything to do with milk/butter/cheese ( but we make concessions when it does actually taste good, because most of the time in sg we get lousy quality milk/butter/cheese which reek of this smell that we absolutely abhor). 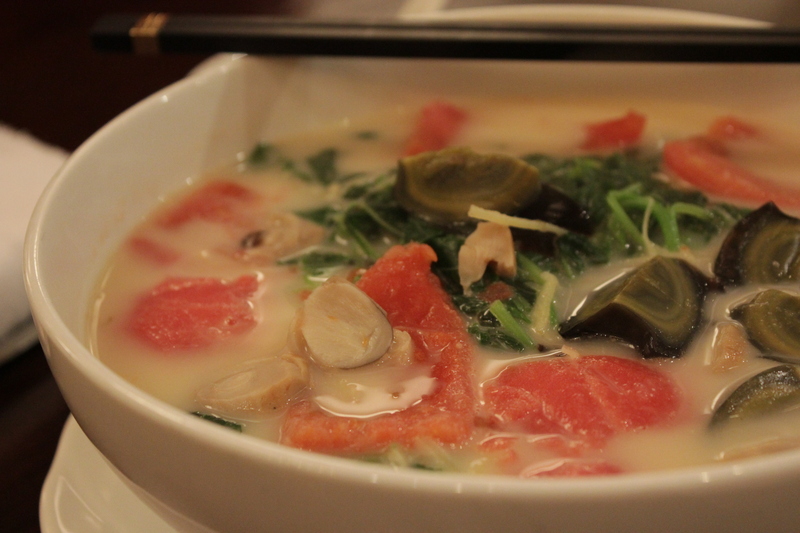 Thankfully the milk base was light, complimenting well with the generous amounts of spinach, sliced tomato, mushrooms and century egg. I liked the extra touch of skinning the blanched tomato slices, which made this otherwise simple dish so much more visually appealing. I was a little shocked when the waiter came to our table with a live fish flopping away in a transparent plastic platter complete with a lid for us to inspect. The black garoupa was plump and very very energetic and I felt a little sorry for its impending fate. All of us were pleasantly surprised at how QQ and sweet the meat was. And there was a lot of fish to go around thanks to the overweight fish. It definitely justified the expensive price tag of 900 hong kong dollars ( This is how much my family values the quality of our fish :D). For meat Dad decided on the pork spare ribs with strawberry sauce. The ribs were chopped into small pieces making it easy to handle without having to look barbaric. 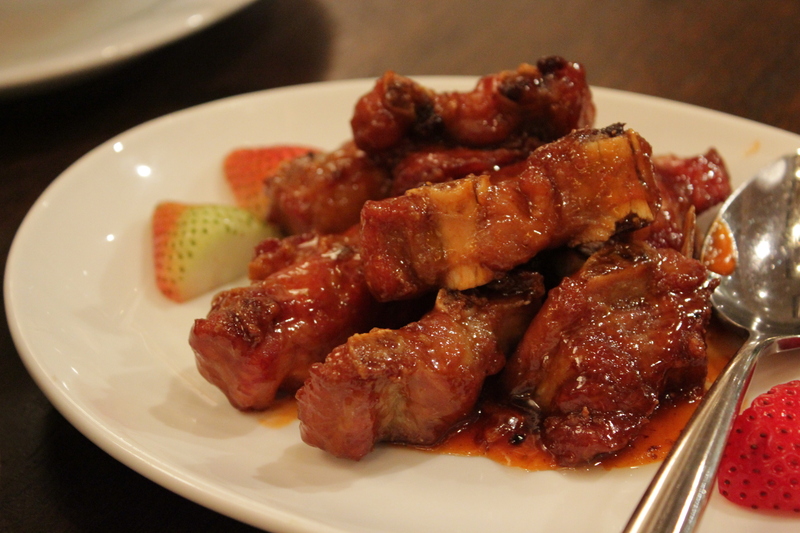 While it may taste very similar to normal spare ribs in sweet and sour sauce, there was a mild strawberry scent in the sauce making it a little different from the conventional. This photo does no justice at all to my favourite dish of the night. 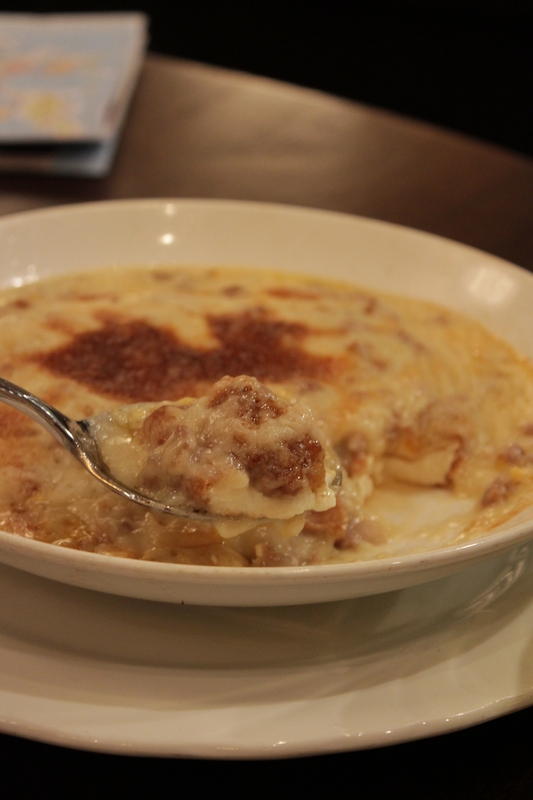 Our waiter told us it was yong tau foo without elaborating on the fact that it was done lasagne style. Imagine our dismay at the sight of cheese! But thankfully it was well executed with pieces of egg tofu, minced meat, mushrooms and light tasting cheese all baked together. I love the tofu because of the strong soybean flavour reminiscent of the ones I had everyday in japan! If only they served it unadulterated so that I could fully appreciate it. I have a really soft spot for tofu and mushrooms so I kept thinking about the tofu I had that day (: Those in Singapore are tasteless passing only because of the smooth texture. Does anyone know where I can get good home made tofu here? Food here is very very pricey with the total bill amounting to about 300 SGD for only the three of us. The bulk of the cost was because of the expensive fish we had. 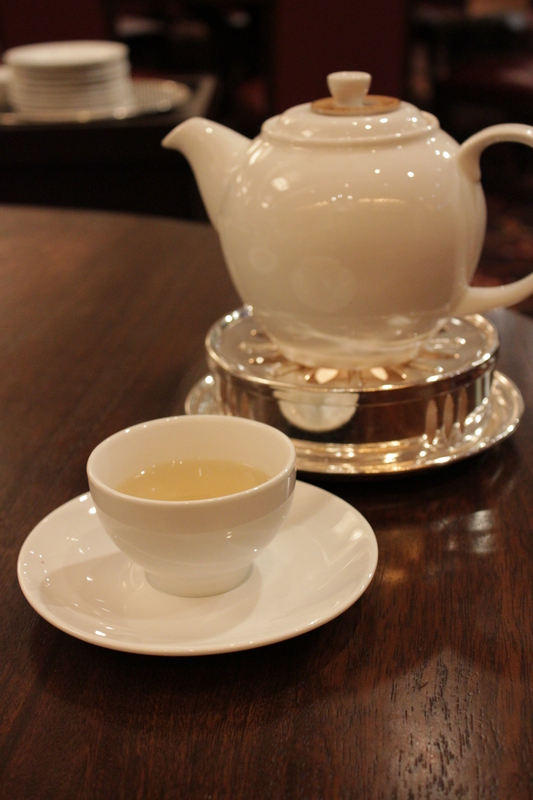 Nonetheless, the standards here do correlate with the price hence we were pretty satisfied with our experience here.